How the hell did this pelican survive after getting shot 110 times? Every year in Israel, countless birds get shot by farmers protecting their livelihood. 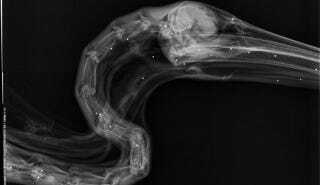 Recently, one of these birds was brought by ambulance to an animal rescue hospital where x-rays showed the pelican had no less than 110 shotgun pellets in its body. Remarkably, the bird managed to live. Yesterday, a badly bleeding pelican was brought to the Wildlife Hospital run by the Ramat Gan Safari Park and the Natuyre and Parks Authority in Israel. The doctors were shocked to discover some 110 shotgun pellets embedded in its body. In addition, it had lost an eye, had a broken wing, and was suffering from acute lead poisoning. The pelican is being treated, including with anti-lead medication and an operation to heal its cracked wing. The hospital says it should recover, though it may well remain lame. But that doesn't condemn it to a life of misery. The hospital places disabled pelicans in specially designated fish pools, which serves two purposes. Not only do they live off the fat fish of the land for life: their presence is noticed by migrating pelican flocks, which will then be likely to land at the designated pool rather than at a fish-farm, the hospital explains. The zoo hospital treats more than 2,200 wild animals a year, almost all of which are injured by humans. More than 60% are returned to nature, and in the case they can't be, arrangements are made for them to live out a comfortable life.